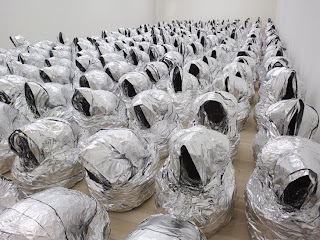 Born in 1970 to an Algerian family in a Paris suburb, Attia has quickly and forcefully imposed himself on the international art scene. His work explores questions of community, diversity, belonging and exile and the tangle of identity conflicts in the age of globalisation. 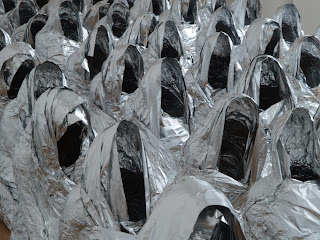 In Ghost, a large installation of a group of Muslim women in prayer, Attia renders their bodies as vacant shells, empty hoods devoid of personhood or spirit. 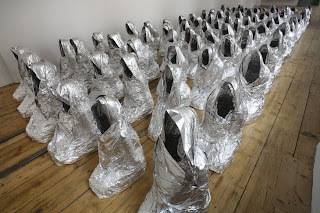 Made from tin foil - a domestic, throw away material - Attia’s figures become alien and futuristic, synthesising the abject and divine. 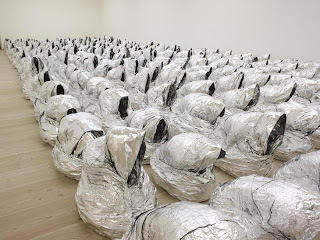 Bowing in shimmering meditation, their ritual is equally seductive and hollow, questioning modern ideologies - from religion to nationalism and consumerism - in relation to individual identity, social perception, devotion and exclusion. 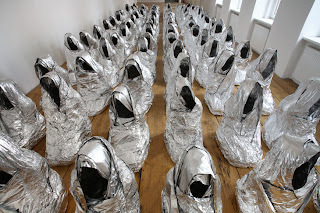 Attia’s Ghost evokes contemplation of the human condition as vulnerable and mortal; his impoverished materials suggest alternative histories or understandings of the world, manifest in individual and temporal experience.